I read this article and found it very interesting, thought it might be something for you. The article is called China’s White Paper on Tibet: Another Attempt to Whitewash 60 Years of Undemocratic Rule and is located at https://tibet.net/2019/03/chinas-white-paper-on-tibet-another-attempt-to-whitewash-60-years-of-undemocratic-rule/. In what is seen as a systematic attempt to whitewash the grave human rights situation and the tragic reality inside Tibet, China issued a new white paper on Tibet yesterday titled “Democratic Reform in Tibet: Sixty Years On.” Similar to earlier white papers, this white paper too claims about all the great things that the Communist Party of China has done for the Tibetans and its achievements in the so-called “Tibet Autonomous Tibet” (TAR) in the last 60 years of China’s illegal occupation of Tibet. China’s State Council Information Office released the white paper just a day ahead of the “Serfs Emancipation Day,” a holiday adopted in 2009, the same year that Tibetan self-immolation protests started in Tibet and just a year after the mass uprisings in Tibet. The white paper claims that in the 60 years after “liberating” Tibetans from “feudal serfdom,” Tibetans in TAR “have become masters of their own affairs” enjoying great ecological and infrastructural progress, and with “the freedom of religious belief of all ethnic groups […] equally respected and protected”. If the situation was so good, then Tibetans would not have continued their peaceful protests against the oppressive Chinese rule forcing them to take dire measures of self-immolation. Since 2009 there have been 153 self-immolations reported in different parts of Tibet predominantly calling for freedom for Tibetans and the return of His Holiness the Dalai Lama to Tibet. 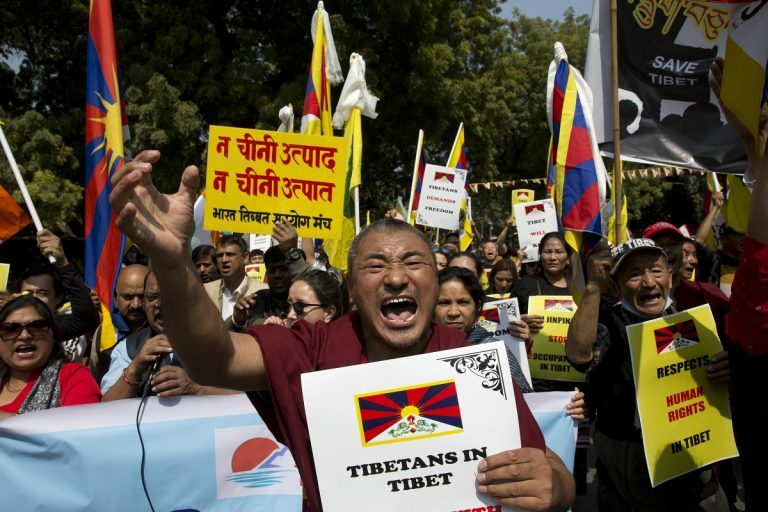 Sikyong Lobsang Sangay, the President of the Central Tibetan Administration (CTA) in India, has frequently pointed out that Tibetans have set themselves on fire to protest against the Chinese policies of political repression, cultural assimilation, economic marginalization, and environmental destruction. Additionally, concerns raised by independent human rights experts in the free world and highlighted in various international reports contradict the claims made by China in the white paper. For instance, the Freedom House in its Freedom in the World 2019 report has once again ranked Tibet as the least free region in the world with no freedoms, political rights, and civil liberties. On the much chest thumping pompous claim of China on economic development in Tibet, the Freedom House reports, “the Chinese government’s economic development programs in Tibet have strongly encouraged ethnic Chinese migration to the region, disproportionately benefited ethnic Chinese residents, and exacerbated the marginalization of ethnic Tibetans, who have also been displaced by mass resettlement campaigns within Tibet.” This is very much similar to how colonies are exploited by the colonial powers in the name of economic development. China’s so-called economic development are in pocketed areas of TAR which are heavily populated by the Chinese migrants and for self-serving purposes. The global significance and ecological sensitivity of the Tibetan plateau, the “Third Pole” and “Asia’s water tap” is constantly emphasized by environmentalists, including the Chinese environmentalists. They blame human activities such as “deforestation, urban expansion, and infrastructures such as roads, dams, and power grids for profound changes in surface coverage in the region.” A CTA response to China’s white paper on Tibet’s ecology in 2018 discusses the rampant open-air mining works and developmental projects that have caused much damage to Tibet’s fragile ecosystem. The report clearly underpins the lack of respect for the environment and the lack of sincere desire for environmental protection by the Chinese authorities. The confrontational attitudes of successive leaderships like Mao’s “man must conquer nature” have led to further damage of the local environment and destruction. One major drawback of China’s paper is the nonchalant dismissal of all the other Tibetan areas that are incorporated into Chinese provinces of Qinghai, Sichuan, Gansu, and Yunnan, constituting about two-thirds of the Tibetan population and Tibetan areas.